Does your email look like spam? Email marketing can be a great way to stay in touch with your customers – if your emails are not flagged as spam. No business or company wants their emails to be referred to as spam. However, even the most justifiable email marketing campaign can be marked as spam if it does not observe best practices. Both email and internet service providers are constantly working to avoid spam messages from being delivered to their users’ inboxes. 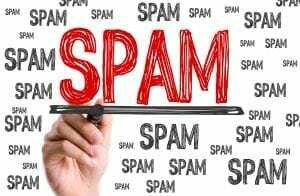 If businesses are not careful, their email messages could end up in the spam folder, reducing the effectiveness of their marketing campaign. Email Size: Sending files larger than 110 KB are more likely to be marked as spam. To maximize delivery, email marketing campaigns should keep email sizes between 15-100 KB. Spelling and Grammar Errors: When composing business emails, it is imperative to ensure your emails are free of typos and poor grammar. Both spelling and grammar errors are generally an indicator that the email message is spam. Even if the spam filter does not catch these types of mistakes, it is highly likely that an alert consumer will. Trigger Keywords: Trigger words should be avoided at all costs. Artificial Intelligence software is designed to look for certain words. Once a business has used a trigger word they will most likely be marked as spam. Avoid Phishing Terms: Business Email Compromise (BEC) scams are used to trick people into transferring money or providing personal information. Businesses should avoid common spam phrases in email subject lines to prevent emails from being flagged. Not Using Alt Text with Images: Alt text is a feature that has been added to the image tag in HTML. This text will help search engines understand what an image is about. Many email programs will not display the image if an alt text has not been added. Excessive Symbols: Anytime symbols are used more than once, they are considered spam. Do not use multiple $$$ or !!! in your email marketing campaign. Domain Reputation: The reputation of a website can determine if an internet or email service provider will flag emails as spam or not. Ensure your emails are delivered by protecting your reputation and avoiding unethical business practices. Provide an Unsubscribe Link: Legally, all emails must include an unsubscribe link in the footer. Providing recipients with a clear opt-out option is a must! Suspicious Links: Ensure any added links look legitimate. Spam filters are designed to pick up on any links that appear suspicious or out of place. Although these suggestions do not guarantee 100% email delivery, they will significantly reduce the chances that your email marketing campaign will be flagged by spam filters. Whether you are just starting your marketing strategy or are looking for a fresh take, contact CourseVector’s team today. Our team can assist you in developing an effective marketing campaign designed to maximize your customer database.